"Mobiles Lernen: Grenzen in konvergenten Umgebungen überschreiten"
Videos, photos, slides, texts and further materials are available via the the section "resources" below. The book of abstracts that contains most of the presentations held at MLCB is available for download here. Download the MLCB programme by clicking here or on the image below. The photos that were taken during the conference can be watched below or on the LMLG flickr profile page. Graham Attwell, Jenny Hughes and Dirk Stieglitz hosted the Sounds of the Bazaar internet radio show live from MLCB. The podcast is available on the Pontydysgu website. Direct URLs: Day 1 and Day 2. Some of the presentations were recorded on video. These videos as well as some interviews and vox-pops which were recorded during the conference can be watched below. Use the full screen mode to enlarge the videos. Slides of presentations and workshops are collected on the MLCB Cloudworks cloudscape. In case you presented and didn't upload your slides yet: please take a few minutes and make your materials available. The MindMap of the #MirandaModBremen can be accessed here. URLS to the wiffiti screens, collaborative mind maps, and cloudworks spaces are available in the section "online collaboration tools" below. EduCamp & 'Mobile learning: Crossing boundaries in convergent environments' Conference go on board: MS Treue (www.treue-bremen.de). A limited number of single and double rooms is available for conference attendees at the Youth Hostel. Also, hotel rooms are available for special University rates. Please indicate your room reservation in the registration form. Usually, tickets are available inside the trams. You might also want to see www.bsag.de for detailed information about public transport in Bremen. By foot: The conference is within about 15 minutes walking distance from the Central Station. By Tram: Take tram number 1 (to 'Huchting'), leave at 'Am Brill'. By Bus: Take bus number 26 or 27 (to 'Huckelriede'), leave at 'Am Brill'. Starting from 'Am Brill', walk 200 meters rightwards along the river Weser. Take tram number 6 (to 'Universität'), change at 'Domsheide' to tram number 2 or 3 (to 'Gröpelingen') and leave the tram at 'Am Brill'. The conference provides space for un-conferencing. The following formats are offered, but there will also be room available for "autonomous" sessions that are not planned and chaired by the MLCB organisers. Graham Attwell will introduce in radio making and streaming. This small workshop is followed by a live radio session during lunch time. Participants get together in small groups and choose a topic on which they are then going to work during the following hour. Aim is to produce a 1 to 2 pages paper that has to me made public on the internet by the single groups. Poster are exhibited on walls or displayed through video projectors positioned in the foyer of the venue. A guide guides the audience from poster to poster. At each of the stations, the poster’s author gives a short presentation. The audience is invited to ask questions and to step into a dialogue with the presenter. The group will afterwards rotate to another poster. Poster session will be held in English and German. Duration of the individual presentations is chaired by the guide and depends on the number of posters. Participants post provocative statements on wiffiti (http://wiffiti.com/). Participants then choose issues by voting which will be discussed within 5-10 minutes by this day’s session chairs. Audience will vote the winning side. Participants will line up in pairs. Each pair gets 5 minutes to present themselves to each other. After 5 minutes, the participants will look for another unknown person. After 30 minutes, you will have met 6 new people from the field. Aim is to learn about people around you which might be helpful to address specific issues in the second half of this un-conferencing session. In ther second half-hour-slot, after this speed dating session and when people are familiar with each other and learned a bit about peoples’ research focus, participants get together - either in small groups or as plenum - and present their own work by making short statements (1 minute). By doing so, they point on areas that worked well and that can be adopted by others. Also, they point on specific issues that caused problems during the work and which need to be resolved. Participants answer and provide support by giving input in form of their experiences. This should not take more than 4 minutes so that, by the end of the un-conferencing session, 6 projects were discussed. One of the aim of this un-conerencing session is collaborative problem solving. Participants will produce small 3-minutes how-to videos with their mobile phone cameras. To plan this video, people meet in small groups and write a story board (within 5-10 minutes). Further 5-10 minutes are dedicated to recording the video. Cutting is not allowed (one take, one shot). 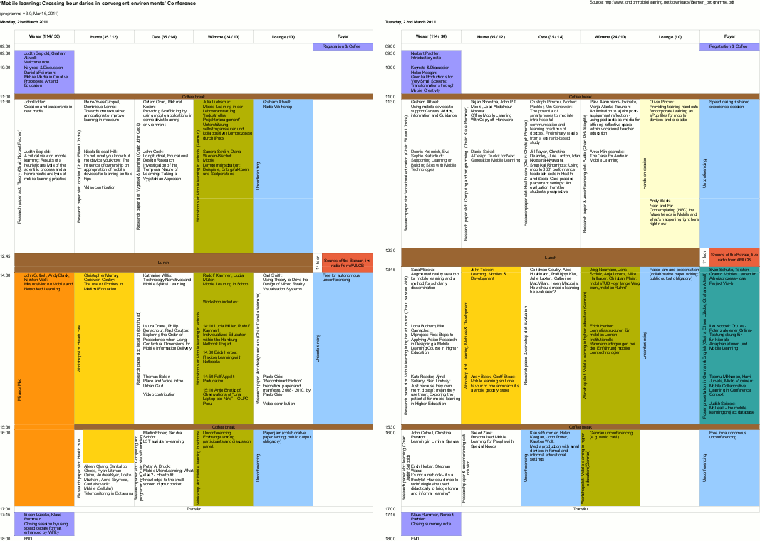 Slots free for un-conferencing filled and chaired by participants. 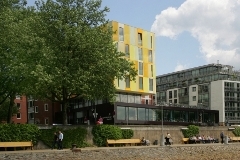 Please register via http://www.londonmobilelearning.net/registration_bremen.php to attend the MirandaMod. Fees apply for on-site participants only. Registration is open until March 6th, 2011. In the MirandaMod John Cuthell will outline the ways in which MirandaMods can be set up and implemented; the technology required and the ways in which liminal spaces for learning can be created. Participants will experience the techniques and strategies at first hand. Andy Black will explore interplay been outdoor learning & digital technolgies. His input is entitled "Its not all about classrooms and schools - taking learning outside and bring it back into the classroom". Building on the work of John Davitt www.newtools.org who Andy had the pleasure of being a co-founder of Learning on the Beach. Andy, challenged by John’s creative thinking, will examine how the outside can mixed with digital from Geocaching to Natures Pallet. It’s not about the tech; it’s the learning: it’s not always about the final outcome but it’s always about the journey. Andy will work with participants to suggest possible base scenarios they could employ but more importantly for the participants to suggest and share their ideas. He might even allow you sit down if your’re lucky. #LOB10 is a conference where you don't sit down on a chair. The YouTube describing what participants from last years inaugural Learning On the Beach can be accessed via http://www.youtube.com/watch?v=UmYZR09_y9w. Learning on the beach site and how to attend the 2011 gathering can be found at http://lob11.wikispaces.com. what are advantages and disadvantages of shooting with students phones vs. brick cams vs. semi-pro camcorders? how important is mobile access to video for learning? what subjects are great for learning by shooting, and which are not / harder (if there are any)? how to do great how to / explanation videos? film aesthetics vs. explanatory quality - match or struggle? John Cuthell is the Research and Implementation Director for the MirandaNet Academy, working with teachers on a range of e-learning and change management projects and involving varied web-based communities. Since 2001 he has co-ordinated MirandaNet action research projects: with teachers evaluating the impact of interactive whiteboards on teaching and learning involving schools and educationalists in Mexico, China, South Africa and the United Kingdom; with e-learning and e-facilitation courses; with a team of MirandaNet Fellows to support the introduction of computers into schools in Free State Province, South Africa. recent MirandaNet projects include the implementation of Visual Learning and the role of professional development in ICT, (particularly with web-based communities of practice). Karsten D. Wolf is doing research on learner participatory learning environments before the Web was even 1.0. Karsten is now heading a lab "media education/educational media". A recent focus of his work is learning by teaching in online video communities using mobile technology. You can find some more info at his recent work blog http://www.ifeb.uni-bremen.de/wolf (in German language), as well as in slides at http://www.slideshare.net/kadewe (both, in English and in German language). Karsten twitters as @kadewe. Eingeladen sind alle, die sich aus theoretischer und praktischer Sicht für das Thema des Lernens mit mobilen Technologien und konvergenten Medien interessieren oder aus anderen Disziplinen heraus Anknüpfungspunkte an die Themen dieses Bereiches sehen. Eingeschlossen ist auch die außerschulische medienpädagogische Arbeit sowie die Nutzung digitaler Technologien in Bildungskontexten jeglicher Art. Dabei sind nicht nur WissenschaftlerInnen sondern auch LehrerInnen, PädagogInnne, ErzieherInnen, Distributoren, EntwicklerInnen und Unternehmen angesprochen. Interdisziplinäre Ansätze sind ausdrücklich erwünscht. Die Organisationssprache ist Englisch, allerdings findet die Konferenz zweisprachig – deutsch und englisch – statt. Der m-learning-Konferenz geht ein EduCamp voraus, wobei sich die Teilnehmer beider Veranstaltungen bei einem formlosen Get-Together am Sonntagabend treffen und austauschen können. Während der Konferenz lädt MirandaNet zu einem MirandaMod ein, der sich vornehmlich aber nicht ausnahmslos an LehrerInnen, ErzieherInnen und andere im praktischen Bildungsbereich Tätige richtet, die Interesse am Lehren und Lernen mit digitalen und tragbaren Technologien haben; Teilnahmemöglichkeit dazu besteht auch über online-Videokonferenz. Pontydysgu wird mit dem „Sounds of the Bazaar LIVE Radio Programme“ Interviews live über die Konferenz berichten. Die Veranstalter verfolgen ein Konzept, das vielfältige Präsentations-, Diskussions- und Teilnahmemöglichkeiten erlaubt, um den nachhaltigen Austausch von Theorie und Praxis und eine fruchtbare Diskussionskultur zu ermöglichen. Der call for papers zur „Mobile learning: Crossing boundaries in convergent environments“ Konferenz findet sich – ebenso wie weitere Informationen zur Veranstaltungen und der Link zur Online-Registrierung – hier auf der Tagungswebsite. The ‘Mobile learning: Crossing boundaries in convergent environments’ Conference, taking place in Bremen (Germany) from Monday to Tuesday, March 21st to 22nd, 2011, builds on a series of mobile learning research symposia hosted by the WLE Centre for Excellence at the Institute of Education, University of London between 2007 and 2009. It will focus on the challenges of developing new pedagogic approaches and on the potential of mobile devices for learning in formal and informal contexts. As mobile learning is not only about learning with mobile technologies, but also considered to be "new" learning, the conference will look at challenges for research and practice in understanding the changing social and technological structures allowing the use of technology for learning that are present in our personal lives, in school and in work places. Thus mobile learning crosses the boundary of institutional learning and looks at practical fields like research and medicine, too. Also, the conference will look at the latest developments in hardware and software which can support personalised learning. We will also provide opportunities for 'unconference' events, including the provision of spaces for informal meetings and discussions. Pontydysgu will broadcast their show "Sounds of the Bazaar LIVE Radio Programme" live via internet. In collaboration with MirandaNet, the conference is running a MirandaMod, developed as part of a WLE Centre-funded project, which addresses teachers and practitioners who are interested in teaching and learning with new technologies, and would either like to share their experiences or learn from others. People can attend the MirandaMod in person at the conference or online via a FlashMeeting. Detailed information about technical requirements and collaboration tools will be made available on the conference website. Besides the MirandaMod, the conference provides opportunities to take part in online discussions during the conference. Details will be given in due course on the conference website. In order to allow participants to contribute to collaborative contents in advance, the conference provides spaces on Cloudworks (http://cloudworks.ac.uk/cloudscape/view/2212) and further collaboration tools which will be announced on the conference website in due course. These tools will be open during the conference as well to allow the collection of ideas. Registration for the conference is open to March 6th, 2011. The online registration form can be accessed here. Please note that priority will be given to authors of accepted abstracts as places are limited. Registration fee is 50 EUR per participant (including participation in the conference, coffee breaks and lunch on Monday and Tuesday). Payment details are provided in the conformation e-mail. Students and unemployed participants who registered before March 3rd, 2011 are free. We charge an extra fee of 40 EUR per participant for participation in the 'get together' on Sunday. The ‘Mobile learning: Crossing boundaries in convergent environments’ Conference in Bremen, Germany, will be hosted by the University of Bremen, run by the Department for Media Education and Design of Multimodal Learning Environments and by the Institute Technology and Education (ITB) in association with the London Mobile Learning Group (LMLG; www.londonmobilelearning.net), Pontydysgu and MirandaNet. Submission of abstracts for research papers, workshops and posters are invited. The submission for conference activities in alternative formats such as cafe or debate sessions, videos, slideshows, podcasts, cartoons, hands on sessions – or any other kind of format you can think of – is also welcome. The abstracts for research papers should contain 650 words, including keywords. Abstract for alternative formats differ. Full details may be found in the guidelines. Please indicate the thematic strand and the type of activity as well as the language the contribution covers. Proposals can be submitted electronically through the conference tool from October 31st, 2010 to December 5th, 2010, accessible via the conference website. We are especially looking for originality and relevance of ideas and for creativity in proposals, in form and content. All proposals will be subject to a peer review process. What theoretical and methodological approaches are appropriate for research mobile learning? What pedagogic approaches to the use of mobile devices for learning are feasible? How does ubiquitous access to the internet change the dynamics of learning both in and outside the classroom and work place? 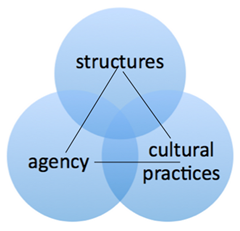 Cultural practices of learning, meaning-making and appropriation: Media usage and the social impact of using networked technologies in everyday life context. How does mobile learning impact on research and innovation? Ethical issues around learning with mobile networked technologies. How can informal learning and learning in informal contexts contribute to learning in formal contexts? How does sign-making and communication with mobile devices impact on language and literacy? What is the rationale for implementing mobile learning in educational settings and at work? What end-user support is important for mobile learning? How can it best be provided? What are the issues around using personally owned devices for mobile learning in institutional contexts? We welcome the exploration of ideas and visions of how our future learning as well as work becomes influenced by mobile technologies and convergent environments. We encourage the discussion of ideas of tomorrow to make meaning of the devices of today. In this strand we provide the space and time for ideas to be explored not in a practical sense but in terms of an utopian situation. Any type of suitable format (video, simulation, images, art, poster) is possible. All proposals accepted will be published electronically with an ISSN number. Please note that all submissions should be licensed under a Creative Commons licence. We are intending to publish an edited book with selected conference papers. As some people might be interested in submitting videos or posters, the conference system accepts - besides the pdf-format for paper submissions - also .jpg, .avi, .ppt and .pptx files as attachments to the submission. This image shows the categories available and required for submitting proposals. 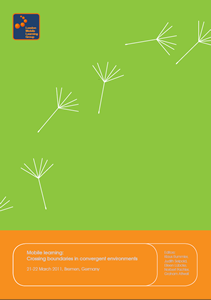 Recent years have seen an increasing interest in the potential of mobile learning: Project orientated research, theory building, technological developments and pedagogically informed approaches to mobile technologies in a range of educational and work-based contexts are evidence for a fast growing discipline. The current transformations in social and technological structures, changing cultural practices of learning as well as changing institutional cultures pose new challenges for learning - be it institutional (e.g. school, university) or work-based, formal or informal. Mobile, networked media play an increasingly important role for meaning-making and appropriation in users’ life-worlds which calls for new understandings in, and approaches to formal learning. As mobile devices offer flexible access to the internet and communication tools for learning within and outside of the classroom, and as they support learning experiences that are personalised as well as collaborative, accessible and integrated within the world beyond the classroom, mobile learning can open up new contexts for learning, with ubiquitous connectivity allowing interactive and connected learning in school and university, in the workplace, in the home and in the community. As for technological developments, mobile and networked technologies and devices become increasingly powerful, the rise of an ‘app culture’ marks a large commercial market, driving a new wave of creativity in the design of learning applications.